For adoption information, please contact Bill or Ruth Silberman, H: 903/841-1835, C: 903/975-0951, or jabahut99@gmail.com. Posted 9/19/16. Dulcina is a 12 month old, female, Black and White Tuxedo cat. She was found by a friend abandoned in a woodland area, when she was about 5 months old. She is spayed, and has all vaccinations. 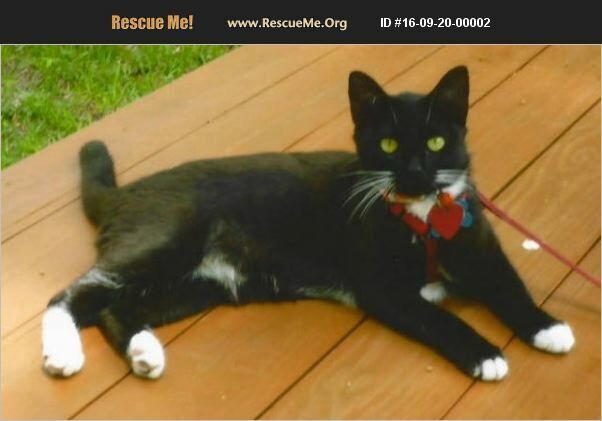 Dulci is smart, playful, litter box trained, and leash trained. She loves to play, and take her morning walks on the leash. She should be inside only; except when walked. She is very friendly with people, but does not like other cats. A one cat home, with children to play with would be great. Estimated to have been born around 2015. We are way out in the woods between Quitman and Gilmer, we already have 8 other cats, two of which were rescued from abusive environments, and one that came to us hungry and had a litter of kittens in our attic, so my wife and I need to find a home for Dulcina.